Pickled Japanese wasabi. 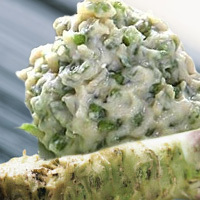 Wasabi-zuke is a side dish featuring coleseed greens flavored with wasabi. Wasabizuke can be eaten mixed with natto fermented soybeans in place of light soy sauce. It may contain trace amounts of alcohol that is commonly covered up by using mustard powder. The calories in Wasabi-zuke per 16g(1tbsp) is 23 calories. Wasabi-zuke is calculated to be 145Cal per 100 grams making 80Cal equivalent to 55.17g with 4.48g of mostly carbohydrates、1.14g of protein、0.08g of fat in 16g while being rich in vitamins and minerals such as Vitamin B6 and Sodium.